I am a part-time mascot for Oxford University Morris Men, who go on tour every year as ‘The Ancient Men’. 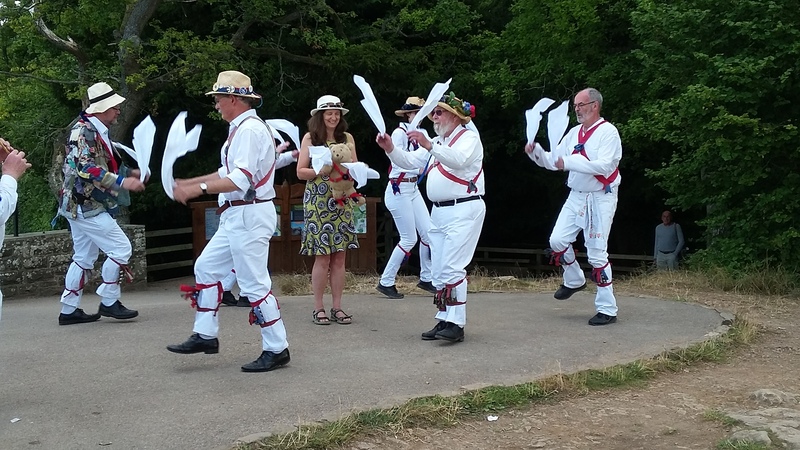 This year, they did a canoeing and dancing tour of the Wye Valley, starting off at Hereford and ending at Symonds Yat East. 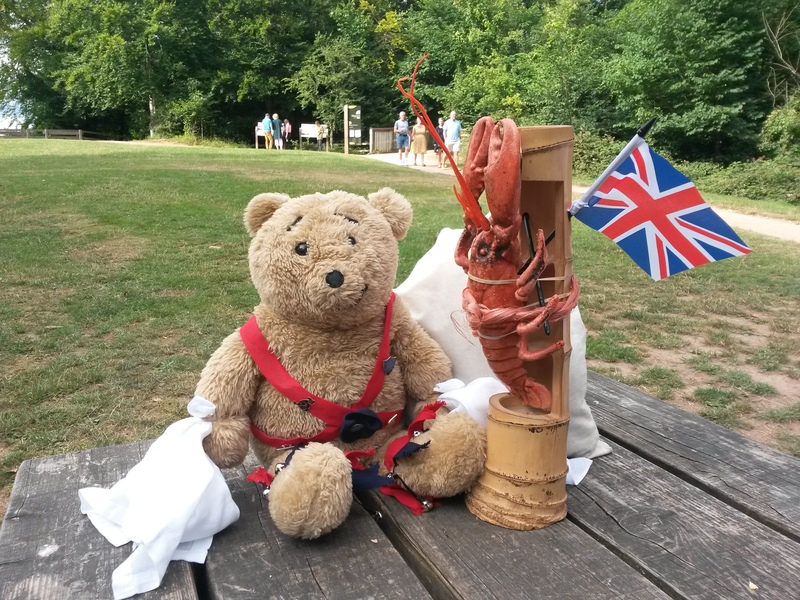 I was jolly pleased that my humans were able to take me along to join The Ancient Men at Symonds Yat Rock. 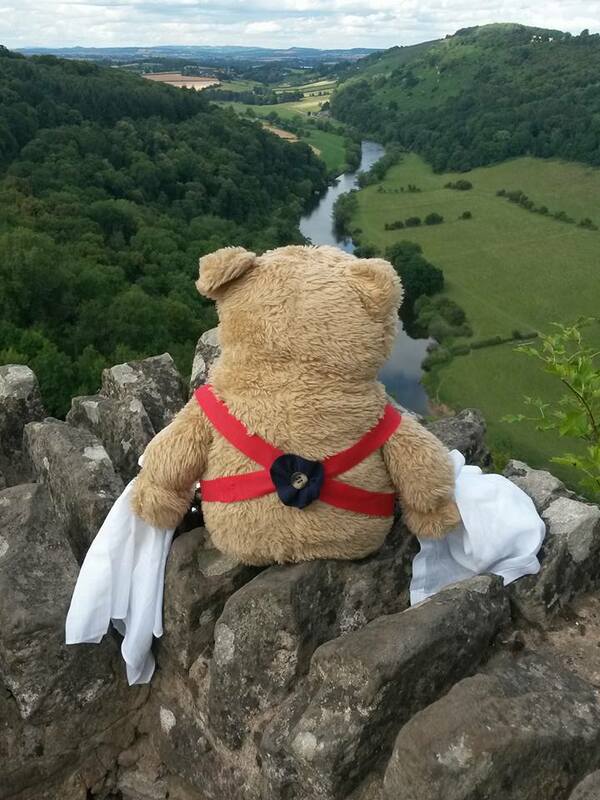 The view at the Rock of the river Wye was amazing. I met Lobby for the first time, a lobster who lives in a box that isn’t the right size for him. 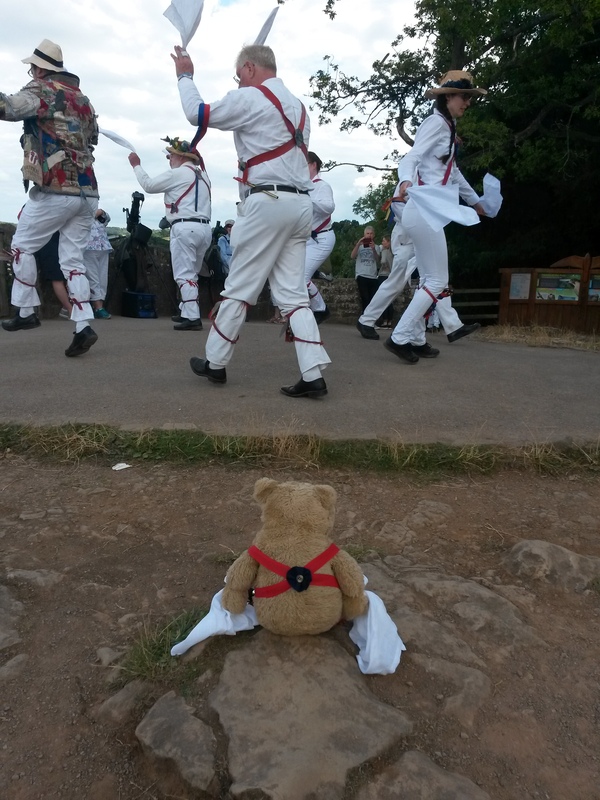 We had a little chat while waiting for all the Morris Dancers to arrive. I watched for a while. It is hard for me to join in due to my short stature. Unfortunately there is a big risk that someone might not notice me and step on me as I am only knee high! My turn finally came to get involved with the dancing when Karen volunteered to do the ‘Maid in the Mill’ dance. I managed to do a fair bit of jolly hanky waving and jangled my bells with everyone else. At the end of the dance something unexpected happened – suddenly the Ancient Men surrounded us and lifted us up into the air. 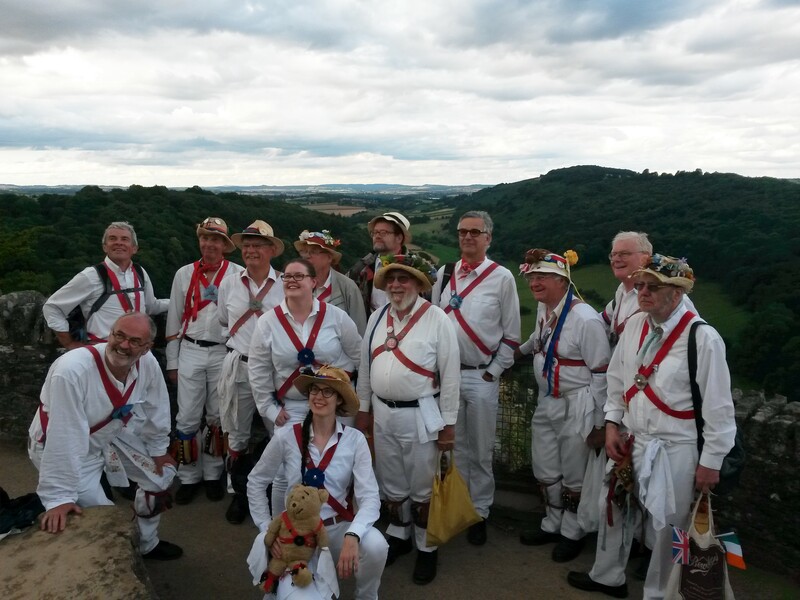 When all the dancing had finished the Ancient Men posed for a group photo with me. Unfortunately Lobby was hiding in a carrier bag so didn’t get in this photo, but you can see the flags that he carries with him poking out the bag in the right hand corner of the picture. I rather like being a mascot for the Ancient Men and hope to meet up again with them somewhere soon. 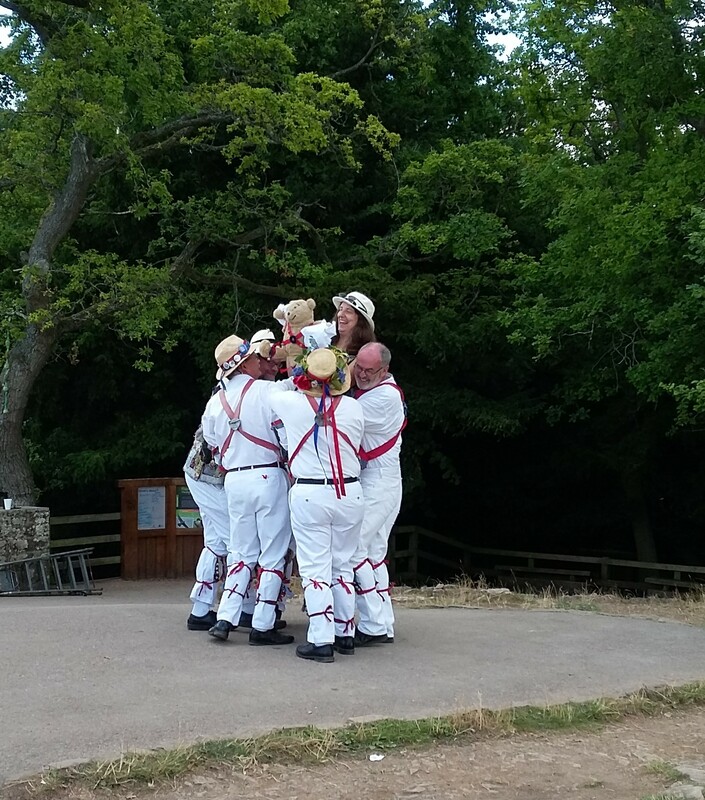 This entry was posted in Uncategorized and tagged Ancient Men, Lobby, OUMM, Oxford University Morris Men, Symonds Yat Rock by karenlovestodance. Bookmark the permalink.